Unlike macs many PCs are likely to be vulnerable to pre-boot Direct Memory Access (DMA) attacks against UEFI. If an attack is successful on a system configured with secure boot - then the chain of trust is broken and secure boot becomes insecure boot. If code execution is gained before the operating system is started further compromise of the not yet loaded operating system may be possible. As an example it may be possible to compromise a Windows 10 system running Virtualization Based Security (VBS) with Device Guard. This have already been researched by Dmytro Oleksiuk. This post will focus on attacking UEFI over DMA and not potential further compromises of the system. UEFI is short for Unified Extensible Firmware Interface. It is the firmware that is running on the computer before the operating system is booted. UEFI is responsible for detecting memory, disks and other hardware required to boot the operating system. UEFI is a small operating system in itself. It's also sometimes a bit sloppily called the BIOS. A brand new Intel NUC i3 "Kaby Lake" purchased in June. 8GB RAM, Win10 1703 with Secure Boot, Bitlocker+TPM, Virtualization Based Security (VBS) Device Guard is enabled. BIOS revision: BNKBL357.86A.0036.2017.0105.1112. DMA access via internal M.2 slot. An older Lenovo T430, 8GB RAM, Win10 1703 with Secure Boot, Bitlocker+TPM, Virtualization Based Security (VBS) Device Guard is enabled. 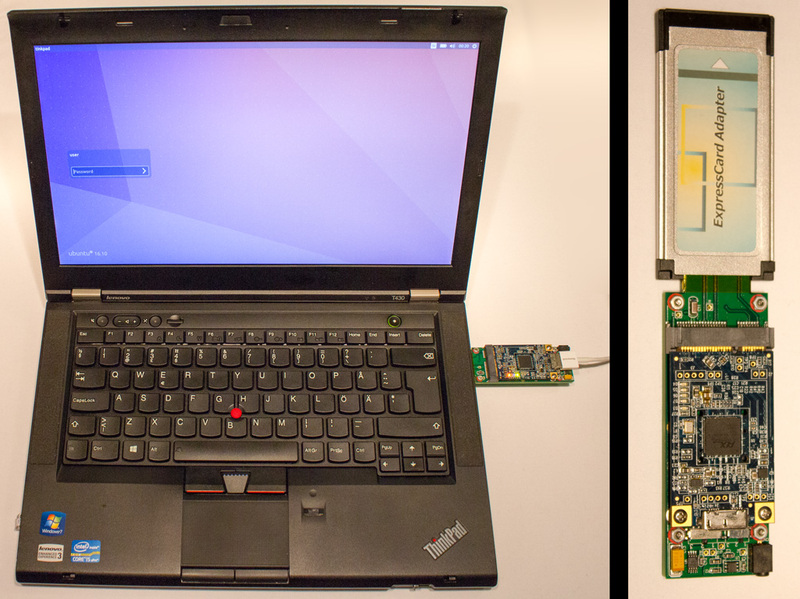 DMA access via ExpressCard slot. T430 to the left, NUC to the right. The root problem is that many UEFIs still do not protect themselves against DMA attacks, despite the hardware (VT-d/IOMMU) to do so being included in all CPUs for many years. 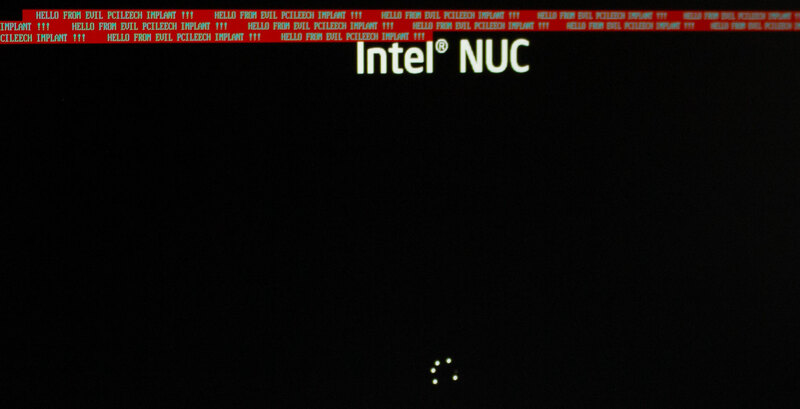 The screenshot below shows PCILeech first searching the memory of a target computer over DMA trying to find where to hook into UEFI. Once inside it's easy to dump memory (also shown) and do other evilness - such as executing arbitrary code despite secure boot being enabled. Loading a PCILeech module into UEFI, dumping the memory and unloading the module. Taking control is a simple matter of finding the correct memory structures and overwriting them if DMA access is allowed. This process is automated with PCILeech. It's possible to automatically search for the memory address of the EFI system table "IBI SYST" - or even better specify it directly to PCILeech. The EFI System Table contains the location of the EFI boot services table "BOOTSERV" which contains many useful function pointers. The boot services functions are useful for both hooking and also calling into from our implanted module. In the example below the boot services function SignalEvent() is hooked. Once the PCILeech "kernel" module for UEFI is inserted it's possible to use it to dump memory and execute code - just as any normal PCILeech kernel module. In the example below the PCILeech UEFI implant uefi_textout is called multiple times. The output is printed on the screen of the victim computer. The text HELLO FROM EVIL PCILEECH IMPLANT !!! is printed multiple times after the PCILeech module for UEFI have been inserted. Once the attack was completed the kmdexit command was issued to PCILeech and the UEFI implant was unloaded. In this case Windows will start booting as shown below. If targeting the operating system loaded it's better to hook ExitBootServices() - which is called by the EFI based operating system loader when the operating system is taking over control of the computer from UEFI. At this point in time it will be possible for malicious code to modify the operating system loader. Windows is booting normally once the PCILeech UEFI module is unloaded. Can I try it myself? Absolutely! The code is available as a part of the open source PCILeech Direct Memory Access Attack Toolkit on Github. 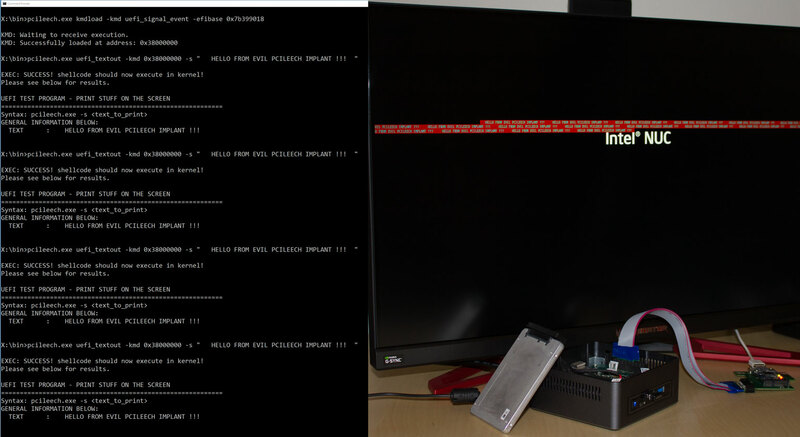 UEFI DMA attacking with PCILeech is now public, inexpensive and easy to perform. DMA attacks agaunst UEFI are no longer theoretical. Vendors should enable VT-d to protect against DMA attacks. Further compromise of the operating system may be possible. It may not be possible to rely on Virtualization Based Security if having a vulnerable UEFI.